The first card in this set is for sending after a diagnosis. The second card can accompany the beginning of treatment, or another milestone. The third offers encouragement for continued healing, even though life may never be back to the way it was before the illness. 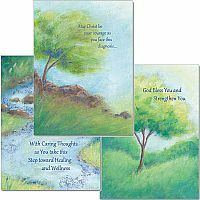 When you order this assortment, you will receive 1 each of "May Christ Be Your Courage," "With Caring Thoughts as You Take This Step Toward Healing," and "God Bless You and Strengthen You" with envelopes. Accompany and support your loved ones each step of the way as they battle cancer or another serious illness. Note: The cards are not wrapped together.